For some people, shopping is entertainment. For others, it’s something to get through without visible or psychic damage. 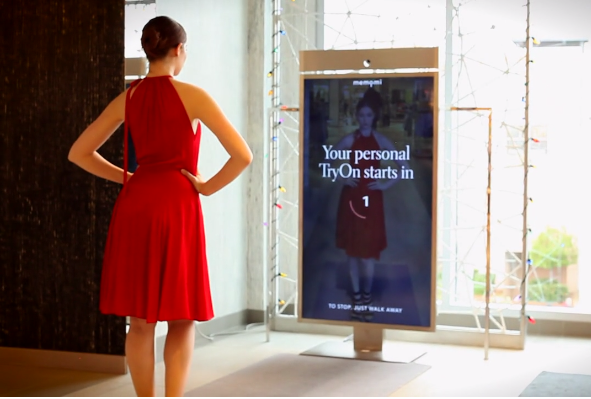 Those emotions, either way, are likely to be heightened with the debut of MemoMi’s new MemoryMirror, a digital mirror that rolls video, 360-degree viewing and social networking into one high-end retail package. MemoryMirror, introduced last year at the National Retail Federation expo, is now rolling out for real at the Walnut Creek California branch of Neiman Marcus, a luxury department store. MemoMi worked with Neiman Marcus to customize the product for that company’s customers. 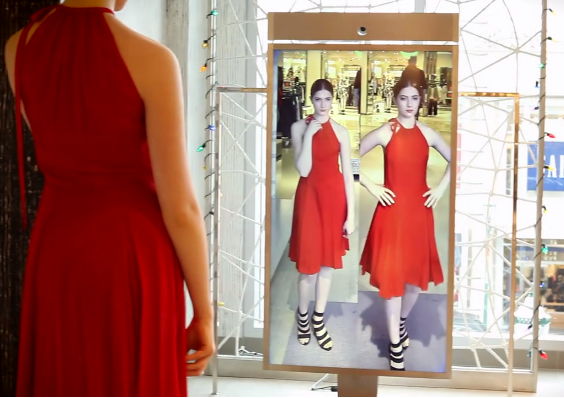 Another example of the increasingly predominant Internet of Things, the MemoryMirror is designed for in-store clothes shopping, capturing stills and video of everything you try on. Using simple body gestures, or via a companion mobile app, you can control the mirror to see 360-degree back and side views and observe outfits side by side. 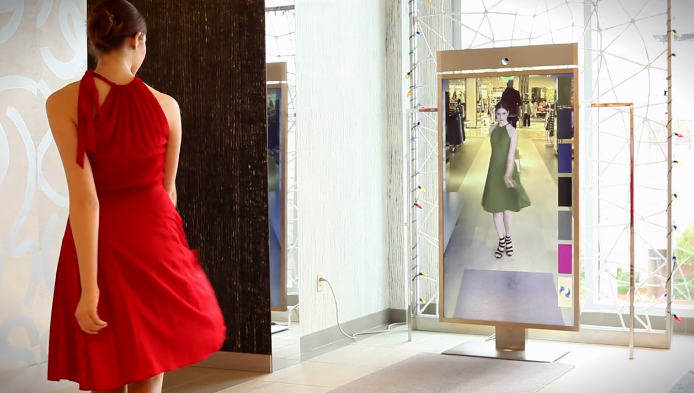 The technology lets you change the color of clothing with a gesture or view an outfit in different colors in real time without changing clothes. How often have you wanted a second opinion while shopping alone? Instead of resorting to a poor quality selfie, the MemoryMirror lets you capture a variety of whole body still and video images that you can share with friends. Maybe all this sounds a little creepy, but Vilcovsky explained that the MemoryMirror is always set up in public areas of the store — not inside fitting rooms — though he said a camera-less version will allow you to browse and see try ons, virtualize them and share them from inside the fitting room. Those images and videos can be saved and shared via email, social media or with sales associates. Retailers also have a stake in this technology: It’s designed to transform and update the personal shopping experience. For example, a special sales associate interface lets Neiman Marcus store personnel send recommendations to customers directly from the mirror. The MemoryMirror can also help retailers gather shopper data by measuring and analyzing in-store behavior, according to an informational video, though that video also says that users control their information and can choose to be anonymous. Retail implementation of this technology will inevitably be different for each retailer. “Over the last several months, our ilab worked directly with MemoMi to refine a final product unique to Neiman Marcus, and significant research was conducted to enhance our customer experience,” said Mimi Sterling, a spokesperson for Neiman Marcus. Neiman Marcus is the first retail outlet to introduce MemoMi to its customers, but there will be others. “We are engaged in the last few months with some of the largest brands in the world, including two of the top five largest clothing brands,” Vilcovsky said. Each store gets a different user experience to fit their brand and customer base. Meanwhile, Neiman Marcus plans to expand the MemoMi to some if its other stores. Two will be installed this month in San Francisco, and two others will soon arrive at stores in Dallas.